Your cat's sneezing might be caused by a litter allergy. Imagine life without kitty litter: No scooping, but your carpet and plants would never be the same again. Both you and Kitty can be allergic to cat litter, but that doesn't mean you have to manage without it. Finding the right litter or allergy medications can help. Think you're allergic to your kitty? You might be allergic to her litter instead. Most cat litter is clay-based, and disturbing it raises a fine dust. The dust can cling to your feline friend's fur, making you sneeze when she rubs against your face. You might also notice allergy symptoms as or after you clean the litter box. If you're sensitive to kitty litter, you might notice runny or burning eyes, runny nose, sneezing, or a tickling pain in your throat that makes you cough. With severe allergies, you can develop hives on your skin where the litter touches you. The basic treatment is simple: Don't get too close to the litter material. Keep in mind, though, that Kitty can bring litter to you on her fur, so wash her and your hands often. Changing the type litter can help eliminate your symptoms. Try hypoallergenic litters made of materials such as recycled newspapers or corn kernels. Over-the-counter allergy medications can also help relieve your symptoms. Keep the litter box away from central air intake vents, which can spread the dust throughout the house. 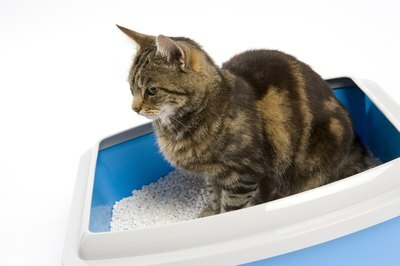 Your cat won't find the relief she needs if using the litter box makes her allergies go haywire. The symptoms can be so unpleasant that she might skip the litter box and use a place that's more pleasant for her but less pleasant for you, such as your favorite potted plant. Her symptoms can be similar to yours, including runny nose and sneezing. She can also develop dermatitis in the areas most apt to contact the litter most directly, such as her feet, her tail and her tush. Your vet can prescribe antihistamines to relieve some of Kitty's symptoms, but changing to a hypoallergenic litter might stop the problem. The fragrance in the litter might be the allergen, so try an unscented litter to see if that helps your kitty. Change the litter often, and keep the box as clean as possible by washing it down once or twice a week to reduce allergen buildup. Bathe Kitty at least once a week -- she might actually enjoy it after a while -- and vacuum and wash her bedding regularly to keep discarded litter dust off her fur. What Are the Benefits of Silica Cat Litters?